For much of its known history this small panel was attributed unquestioningly to Rembrandt van Rijn. Rembrandt's activity as a landscape painter appears to have been confined largely to a period during the later 1630s and is limited to a small and, thanks to re-attribution, ever declining number of works. As early as 1854 Kolloff warned against the tendency to attribute landscapes erroneously to Rembrandt. 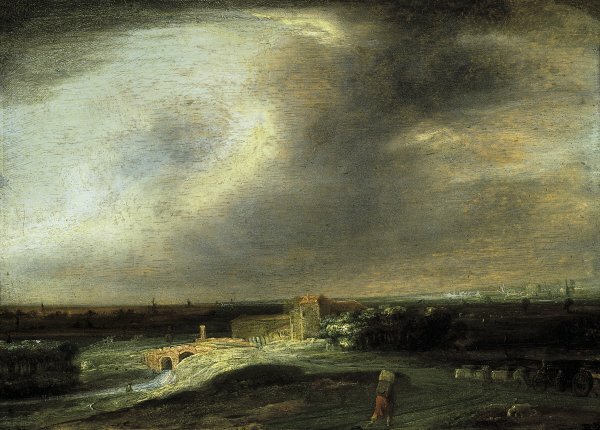 The present work has been read repeatedly in terms of the "pathetic fallacy" by which such landscapes were interpreted as symptomatic of a melancholic poetic vision associated with Rembrandt. A combination of emotional stereotyping, surface dirt, discoloration and damage, commercial interest and deference to both owners and earlier authors inhibited disinterested examination of the panel. The support is of unusually poor quality when compared with those used by Dutch painters of good repute. It was not cut square to the grain and has warped on the right. As early as 1893 Michel noted the pictorial discordances of the picture, characterizing it as an accumulation of rather disparate details. Even allowing for deterioration of glazes and losses owing to over-cleaning, and while bearing in mind the subjective nature of qualitative judgements, the painting can nonetheless be said to exhibit many shortcomings of spatial organization and draughtsmanship. This was stated unequivocally by Van Dyke who was the first scholar publically to deny Rembrandt's authorship of the panel, assigning it to an unidentified pupil. The name of Philips Koninck was first mentioned in connection with this panel by Cook in 1899, an observation elaborated by Gerson in 1936 who noted affinities between the present panel (amongst others attributed to Rembrandt), the panoramic landscape experiments of Jan van Goyen in the 1640s and Koninck's early works. Gerson attributed the present work to Koninck first in 1953, repeating his opinion in 1956 and finally devoting a paper to it in 1965, since when his view has not been seriously questioned. Koninck, trained by his brother Jacob in Rotterdam, was probably never actually a pupil of Rembrandt, though he most likely studied Rembrandt's landscapes after his return to Amsterdam in or shortly after 1640. Nothing certain is known of his painting career until 1647, the date on a signed panel in London with which the present work can be compared. Other early works suggest that, like Rembrandt, he studied the art of Hercules Segers and the division of the receding landscape into alternating light and dark bands in the present panel may have been derived directly from Segers's example. Gerson's proposed date of about 1645 has been accepted by recent commentators, so the present work has been placed as the earliest of a group of comparable landscapes.